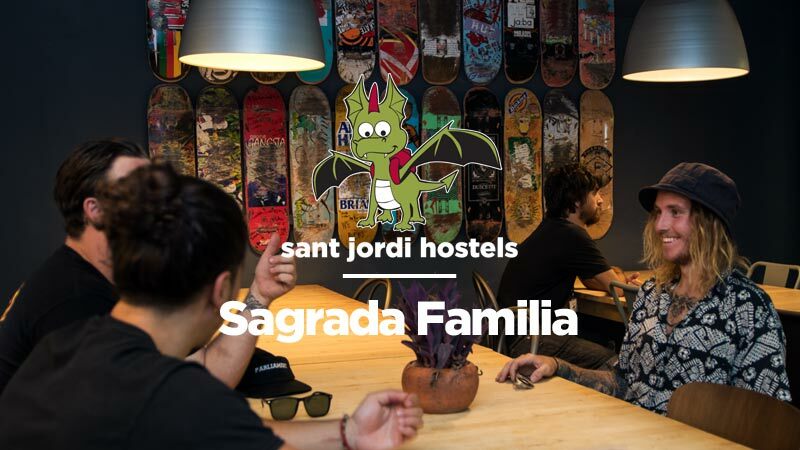 Follow the directions below to find your way to the Sagrada Familia hostel in Barcelona. The nearest metro stations are “Encants” (lines 2) and “Sant Pau/Dos de Maig” (lines 5). Each subway station is about 5 minutes walking from the hostel. Which stop to use depends on where you are coming from – check directions below. Coming from EL PRAT AIRPORT (BCN Airport): In the airport, follow the signs (Red M) to the metro. Take the metro line 9 (Orange) in the direction of ‘Zona Universitaria’ until the stop ‘Collblanc’. Here you swap lines. When you exit the metro, take the lift up and follow the signs to the line 5 (Blue). Take line 5 (Blue) in the direction ‘Vall d’Hebron’ until the stop ‘Sant Pau/Dos de Maig’. Now follow the directions below for “Coming from Metro Stop Sant Pau/Dos de Maig”. Coming from SANTS ESTACIO Train Station: Inside of the train station you will need to find the entrance to the metro. It is at the opposite end of the train station from the McDonalds. Take the metro line 5 (blue) in the direction of “Vall d’Hebron” to the stop “Sant Pau/Dos de Maig”. Now follow the directions below for “Coming from Metro Stop Sant Pau/Dos de Maig”. Coming from GIRONA AIRPORT: Take the Barcelona Bus from the airport to Barcelona Nord Bus Station (final destination). Now follow the directions below for “Coming from Barcelona Nord Bus Station”. Coming from BARCELONA NORD Bus Station: Once at the Nord bus station you can either take a taxi to the hostel (not too expensive because it’s not so far from the hostel) or go with the metro. The metro stop is in the small park just next to the bus station and is named “Arc de Triomf”. The metro line at the “Arc de Triomf” stop is the line 1 (red). Take the train that goes in the direction “Fondo” until the stop named “Clot”. When you exit the train at the “Clot” stop you will have to transfer to the metro line 2 (Purple). With the metro line 2 (Purple) you need to take the train in direction “Parallel” until the stop “Encants”. Now follow the directions below for “Coming from Metro Stop Encants”. Coming from METRO STOP “ENCANTS” – using the L2 (Purple): Take the metro line 2 (Purple) until the stop ‘Encants’. Exit the station using the exit to the left – just next to the kiosk. You will be on the corner of Carrer Dos de Maig and Carrer de Valencia, facing up the street Carrer del Dos de Maig. Continue up Dos de Maig for 3 blocks until you come to Carrer del Rosello. Cross to the other side of Rosello, where there is a ‘La Caixa’ bank and go to your right. 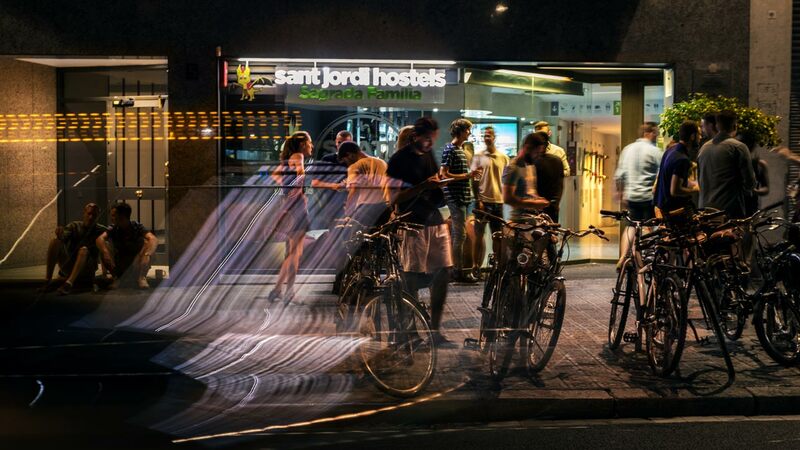 The hostel reception entrance is less than 15 meters from the corner of Carrer Rosello and Dos de Maig but, because the road forks just in front, on the Freser side of the street (directly across the street from the ‘Consum’ market and ‘Bar 504’). It is a pretty large entrance. Just look for Carrer Freser, 5. Coming from METRO STOP “SANT PAU/DOS DE MAIG” – using the L5 (Blue): Take the metro line 5 (blue) to the stop “Sant Pau/Dos de Maig”. Follow the signs that say sortida (exit) Dos de Maig. As you come up the stairs, you will see on the other side of the street the Hospital Dos de Maig. Go to the hospital and continue down Dos de Maig street for 2 blocks until you come to the street Carrer del Rosello or Carrer del Freser. Rosello forks here so just be sure to turn left at the ‘La Caixa’ bank and look for the Freser side of the street. 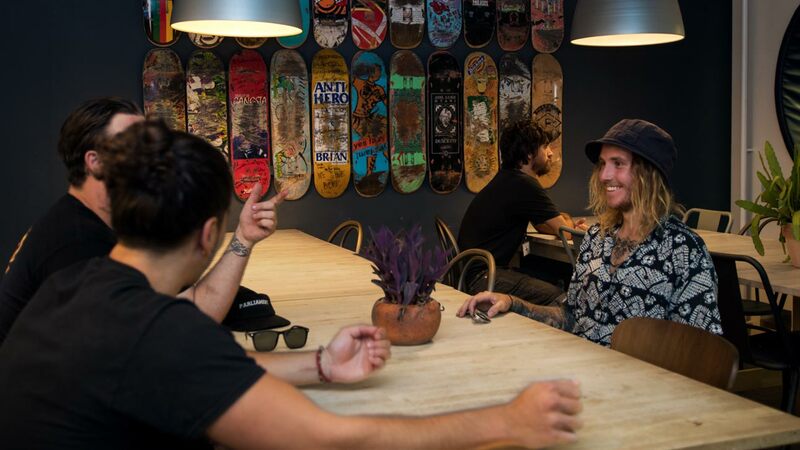 The hostel reception entrance is less than 15 meters from the corner of Rosello and Dos de Maig but on the Freser side of the street (directly across the street from the ‘Consum’ market and ‘Bar 504’). Just look for Carrer Freser, 5.